While doing some provisional work on Arpanet’s ‘Quantum Transposition’ album I made a discovery I believe is worth sharing with you separately, lest its importance goes unnoticed in what will no doubt be a very lengthy article in its own right. Mind you, I’m sure it would have come to my attention a lot earlier if I’d had the correct format! But these things are probably meant to be and maybe some of you had already noticed anyway? 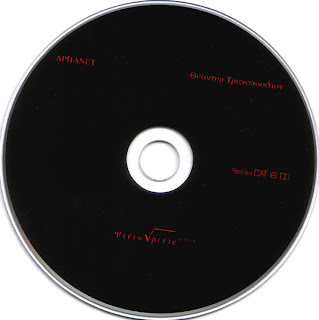 Printed only on the CD itself there is the following equation. The Ψ symbol used by Black Replica is unmistakable. Or is it, I'm only going from a scan, if someone can confirm it I would appreciate it. It may not be in the same typeface but it is does appear to be the symbol. This gives us a whole new context for it, one beyond mere speculation. 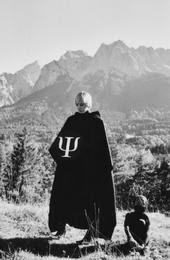 The symbol certainly still represents the Greek word psi which represents the word or study of psychology as discussed before and this fits in well with the Black Replica image and content so far. But what it also now clearly represents is the Ψ particle. I could'nt find if the equation on the CD represents this particle but it led me to investigate if there was a connection between the symbol and mathematics. The particle was discovered in 1974 by a group led by Burton Richter at the Stanford Linear Accelerator Center, who named it as the Ψ particle. Unbeknownst to then, at about the same time in November 1974, the team of Samuel Ting at the Brookhaven National Laboratory found the same signal. They had dubbed their particle, J. It is now commonly known as J/Ψ and has remained a particle which has been studied intensively ever since. So important was this discovery that they jointly received the 1976 Nobel Prize. Why did the first group call it after a Greek letter you might ask? The odd coincidence was that a computer reconstruction of the decay of a J/Ψ particle looks just like the Greek letter Ψ. I’ve reproduced a picture of it for you. "The J/ψ is a subatomic particle, a flavour-neutral meson consisting of a charm quark and a charm anti-quark. Mesons formed by a bound state of a charm quark and a charm anti-quark are generally known as "charmonium". The J/ψ is the first excited state of charmonium (i.e, the form of the charmonium with the second-smallest rest mass). The J/ψ has a rest mass of 3096.9 MeV/c 2, and a mean lifetime of 7.2×10-21 s. This lifetime was about a thousand times longer than expected." Interestingly the Greek Ψ, in biological terms, is also a symbol used to represent water potential. I had been saving this up for my main Black Replica article sometime in the future but now seems like a suitable time to use it. But I stress here that you are free to make of this what you will as you’ll quickly see this belongs more in the realm of speculation. But I think we have learned by now that Mueller and co are more than capable of working on multiple conceptual dimensions at once. There are many levels beyond the surface of all great art. Remember also that in the video and pictures the Ψ symbol appears on what appears to be a shield. There is an ancient rune symbol called the Algiz which is very similar in appearance to Ψ. I found the following interpretation for it. Algiz: (Z or -R: Elk, protection.) Protection, a shield. The protective urge to shelter oneself or others. Defence, warding off of evil, shield, guardian. Connection with the gods, awakening, higher life. It can be used to channel energies appropriately. Follow your instincts. Keep hold of success or maintain a position won or earned. Algiz Reversed: or Merkstave: Hidden danger, consumption by divine forces, loss of divine link. Taboo, warning, turning away, that which repels. Certainly the symbol caries multiple meanings for its users. Maybe these discoveries can be rewarded with some new Black Replica material soon? It's great to see Mueller keeping up the Drexciyan tradition of droppping hints and links between his records. As you can see from this post, I'm not finding them all straight away or maybe at all so please share them with us if you are. This is a truly mind expanding Blog, which makes my explanations of particle physics etc look like the kidstuff it is. After only a 5 month delay the Der Zyklus 'Cherenkov Radiation' 12" finally emerged on Frustrated Funk. It is on dark purple vinyl. But you would be forgiven for thinking it was so dark purple as to be black. But hold it up to the light and you'll see the purple. Although I would expect Mueller sees it as more of a violet than purple. This is because Cherenkov Radiation is in the ultraviolet colour spectrum. The human eye only sees it as a bright blue, the glow of cherenkov radiation from a nuclear reactor. In fact it mostly exists visibly in the ultraviolet colour spectrum which the human eye cannot see. The sensitivity of the human eye peaks at green, and is very low in the violet portion of the spectrum. Hence violet or a dark purple would be the nearest colour we can relate to it. This certainly proves at least two things about Mr. Mueller; he is a real stickler for detail, like any good scientist and that he has thought about all this fairly deeply and completely. I for my part, appreciate what he is doing by in turn thinking deeply about it myself and finding all this stuff he buried just underneath the surface. It is also good musically, but it's my policy not to describe it - in anymore detail than I already have - straight away, so will comment on this release when I get to it in about a year or more at this rate! One other piece of additional info did emerge on issue of the 12" however. 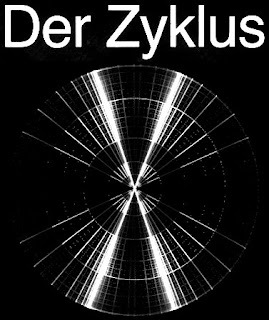 For some time now a Der Zyklus MySpace has had the circular patterned label image up which I've included here. I'd always thought that this was a fan page up to now but at the very least it appears to be maintained by someone with connections to the group or even by the man himself? There are other original images there as well plus a link to Drexciya's 'Hydro Theory' YouTube video, 3 old Der Zyklus tracks and various other bits, so again, make up your own mind how official it is. Time for a round up of a few other loose ends. Noticed this recently. If you never got to download the Arpanet audio promo, 'Time Shifting' which appeared I think as a radio show kind of thing on http://www.cbs.nu/ then you can download it both in English and German language versions from this link. If memory serves all the tracks featured are unreleased Arpanet/Gerald Donald music. It's a cool little extra and you learn something, can't be bad. On the speculative side; if you ever wondered how Heinrich Mueller finds the names for his projects how about looking no further than the equipment in his studio. The Zyklus MPS is a now rare and retro 80's midi sequencer which I think could make some sounds we would be familiar with. Check it out on this demo video and see if you agree. Lastly while on this subject, the keyboards which Dopplereffekt have been using when playing live lately are a pair of Korg Triton Le 61 key workstations. There is a new Zerkalo video up called 'When I Was Sick' on YouTube. Hard to know what, if anything, Heinrich Mueller did on this track but it's ok in its own right. 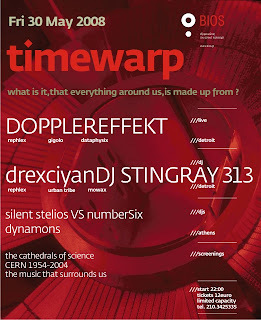 Dopplereffekt appear to have a seated show in Athens, Greece on 30th May. DJ Stingray is also on the bill. The flyer is reproduced at base of post. It is in a venue called Bios and tickets are 12euro on the door.